Visit Alaska and join Nenana Raft Adventures for raft trips and land tours exploring Alaska's spectacular wilderness areas. From mild to wild, we run some of the most beautiful rivers in the world. Our raft trips range in length from two hours to two weeks. We offer a variety of multi-day expeditions on the Tana, Chulitna, Talkeetna and Copper Rivers. On these trips you'll spend days on the river paddling, hiking and exploring with your guides and your nights in camp with peace, solitude and delicious meals. For guests travelling on tighter schedules we offer several half day and full day raft trips in the Anchorage and Denali National Park areas. Choose from peaceful paddles, whitewater introductions or heart-stopping Class V descents. 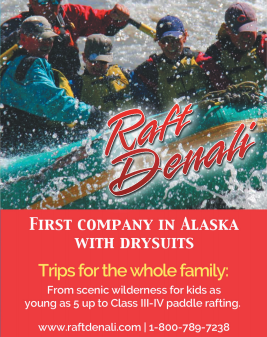 Exploring Alaska by raft utilizes a low impact means of travel through Alaska's vast wilderness and riparian areas. Rafting maximizes your opportunities to experience Alaska while ensuring that we leave a light footprint. With magnificent scenery and abundant meals, a raft trip is more than whitewater. It's an opportunity for self-discovery. The chance to make new friendships and renew old ones. What you'll discover is that friendships made around our campfires will last you a lifetime.